EngageSportMode likes cars that are painted orange. It also likes the Dodge SRT Hellcat twins. Someone, somewhere, has been listening to our prayers it would seem. Thank you! We’re not sure which sacrifice, offering or blessing it was that made this happen – we’re just pleased one of them worked. Joking aside, the option to purchase a 707hp Challenger or Charger SRT Hellcat in a classic Dodge colour makes us rather happy. The wonderfully named ‘Go Mango’ orange paint option was first introduced on the 1970 Dodge Challenger, producing one of the greatest muscle car colour combinations ever. We saw Dodge offer ‘Plum Crazy’ on the Challenger and Charger models last year, but orange was always going to be our favourite. 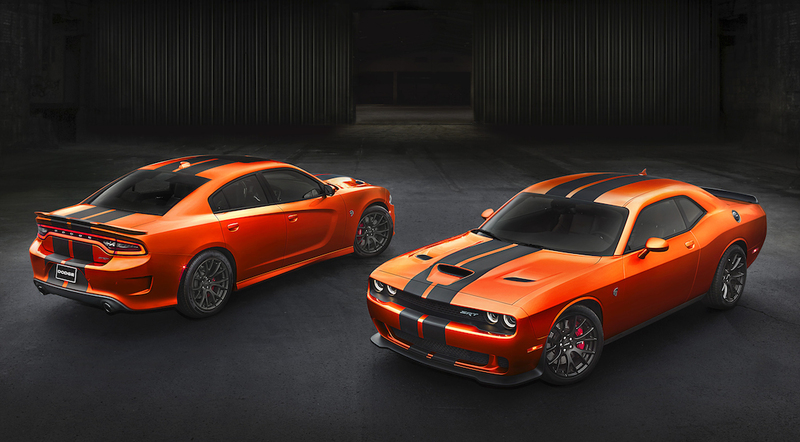 You don’t have to be ordering a supercharged 6.2-litre Hellcat model to live out your tangerine dreams, as it can also be specified for the SRT 392 models. But, let’s be realistic here. You’re buying a ridiculous bright-orange muscle car. You need to buy the one with a 707hp 6.2-litre supercharged V8 engine, not the one with only 485hp. You’d never have to worry about losing your car in a parking lot. Or worry about friends asking for a lift home. If you’re lucky enough to be in the United States, you can head on down to your local Dodge dealer and order one of these bad boys right now. Hopefully it’ll arrive before Donald Trump ends up as President as, by that point, he’ll be the most important orange-coloured thing in the USA. We’ll leave you with that frankly terrifying thought.